The OSM’s performance of Concert Românesc was as tightly executed and polished as anything I’ve heard played by the orchestra. 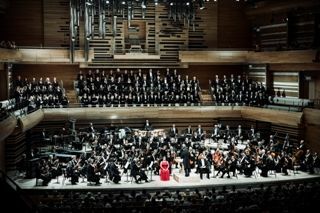 It recalled the glory days under Charles Dutoit with their signature pieces of Ravel’s La Valse and Daphnis et Chloé. Nagano maintained tension and a driving beat throughout the 13-minute work. The strings were lush and in perfect unison, the solo dances by Concertmaster Andrew Wan riveting in their speed and technique. Not to be outdone, the orchestra drove itself to even dizzier heights leading up to the conclusion. Despite a few drawbacks, Carmina Burana was still a fine performance. The highlight was unquestionably the chorus. The men were tightly focussed and sang with warmth, confidence and melodic ease; the women’s sound was at times just slightly less even and somewhat strident. But together with the orchestra, the thundering opening and closing “Fortuna” could not have been more sensational. The orchestra kept up the energetic beat set with the Ligeti piece, and apart from some slipshod work form the trumpets, played with close attention to detail and dynamic markings. Concertmaster Richard Roberts (yes, there are two concertmasters) acquitted his solo work admirably in “Tanz”, recalling the folk rhythms in Concert Românesc. Soprano Aline Kutan sang with an angelic, bell-like tone with hardly a hint of vibrato and delivered a sublime “Dulcissime”. Tenor Frédéric Antoun brought the right amount of color and anguish to “Olim lacus colueram”. Baritone Russell Braun, however, showed the same lack of ease and poor projection he exhibited here last spring in Britten’s War Requiem. Overall, however, an impressive season opener. A note on the acoustics: This is the beginning of the 5th season in the orchestra’s new hall and the acoustics are finally just right.